Many new mothers have questions about menstruation and breastfeeding. What is “normal?” The answer: Just about anything. Have you heard different experiences and stories when it comes to your friends’ periods? 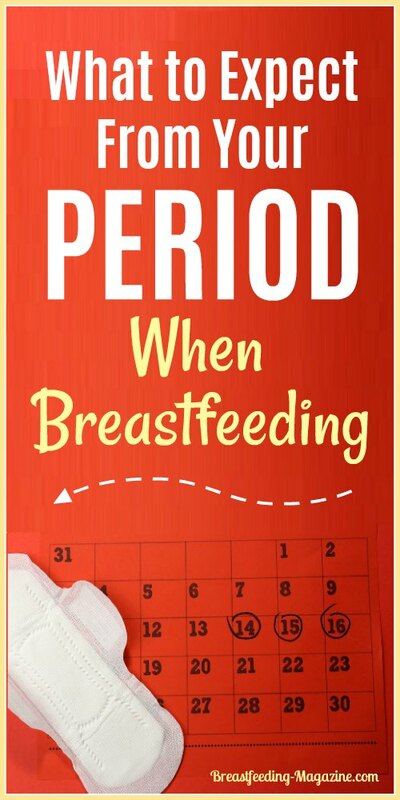 While some women never experience a period while breastfeeding and consider it their birth control for six months or longer, other women may experience irregular periods while still others resume regular periods while their babies are still feeding at least part-time. Let’s start by saying that it is possible to have your period while you’re breastfeeding, and many women do have irregular or light periods throughout their breastfeeding months or years. It all comes down to a hormone known as prolactin. This is the hormone that regulates the production of milk while you’re breastfeeding, but it also naturally suppresses menstruation. The more prolactin you have in your body, the less likely you are to have a period. Once your milk is in less demand and you start to produce less of this hormone, you’re likely to resume your menstrual cycle. Mom Tip: Create an Amazon Baby Registery and Get $100 for FREE Diapers and Wipes! Some women never have a period while they’re breastfeeding even part-time while other women experience a light period here and there throughout their breastfeeding journey. Still other women experience a full return to normal periods as soon as their babies start sleeping through the night or their breastfeeding routines change in some other way. You never know how your body might react or when that first period may appear, so don’t assume that you can’t have a period just because you’re breastfeeding. Remember, this comes down to the presence of prolactin in your system. When your baby starts sleeping through the night or even for longer stretches of time, they demand less milk from your breasts. If you’re actively pumping, you may keep the demand high, which is likely to result in continued production of prolactin. Eventually, you will need to cut back as your baby switches to solid food and depends on breast milk less, and you will eventually have your first post-baby period at that time. For some women, the first period is light or unusually short. Others may experience heavy periods right from the start. You may want to talk about this with your doctor if you’re concerned, but keep in mind that every woman is different and just about anything is considered normal at this phase in your life. Even if you get one period and then it seems to disappear for months, it’s not likely a sign of a larger problem. While there are some medical conditions that may cause irregular periods, it’s common for women to experience irregular menstruation while breastfeeding or even shortly after weaning their baby from the breast. It can take up to two years for some women to normalize their menstrual cycles after having a baby, but it doesn’t take nearly that long for most women. Irregular periods are often a result of fluctuating hormone levels in your body. This can happen if your baby is feeding less often or at different times or when you have a change in your schedule. It may also happen for seemingly no reason at all, but there is no cause for alarm unless you have other symptoms that may hint that something else is happening. For instance, if you’re experiencing pain or discomfort in the abdominal or pelvic region or are losing an extreme amount of weight without explanation. You can always talk to your doctor if you suspect that your irregular periods are connected to other medical issues, but also keep in mind that many women are irregular while breastfeeding. Many new mothers start to worry when they resume their periods and then miss a month or two. That would normally send you running for the pregnancy test, but that isn’t necessary for most women while breastfeeding. Just as irregular periods are common for some women, missing months is also the norm for some women. It’s not entirely impossible to get pregnant while breastfeeding, but we will talk about that in a moment because it doesn’t happen for most women. If you have your first period since bringing your baby into the world and then it doesn’t recur for months, it’s likely a result of your body adapting to the hormone levels and other lifestyle changes that occur after having a baby. You will eventually resume normal periods that are similar to your cycle prior to getting pregnant, but you may need to wait until your baby is eating solid foods and starts to depend on your milk less. 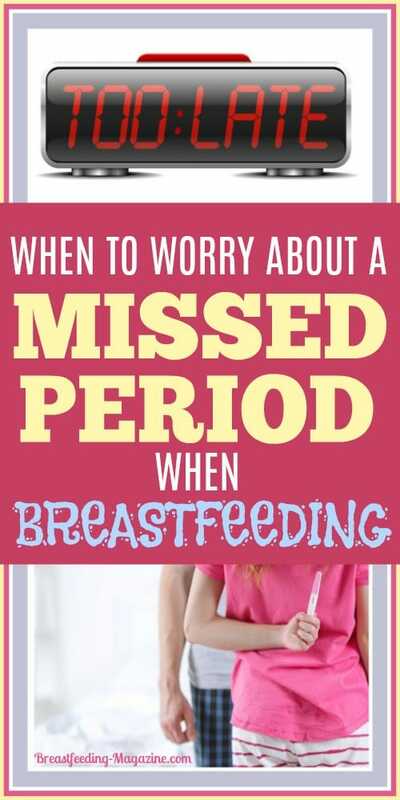 The time to worry about missed periods is when you’re past your breastfeeding days and you continue to experience missed periods, irregularity, or other cycle patterns that weren’t normal to you prior to becoming pregnant. In general, you should return to normal menstruation cycles within six months of completely weaning your baby from the breast. Concerns beyond that point should be discussed with your doctor to eliminate worries about other medical issues. Your little one is less than 6 months old. You have not had a postpartum period yet. Once a baby is older and/or starts adding other foods to their diet, the more likely moms are likely to get their fertility back. HOWEVER, that is no guarantee. The hormone prolactin does stop ovulation in most women while breastfeeding, which is why many women believe that they cannot get pregnant while breastfeeding. This results in a lot of unexpected pregnancies, so it’s time that many women realize that getting pregnant while breastfeeding isn’t impossible. This is especially true if you’re experiencing irregular periods or had one period and then have missed a couple cycles. Most women ovulate without warning or any obvious physical symptoms, so you can produce an egg without realizing you’re fertile. It is possible to become pregnant at that point, even if you don’t yet realize that your menstrual cycle is making a comeback. This is why it’s never wise for any woman to assume that she cannot get pregnant just because she hasn’t experienced that first postpartum period. Breastfeeding or not, if your body produces a healthy egg and you’re sexually active, there’s a risk of pregnancy. 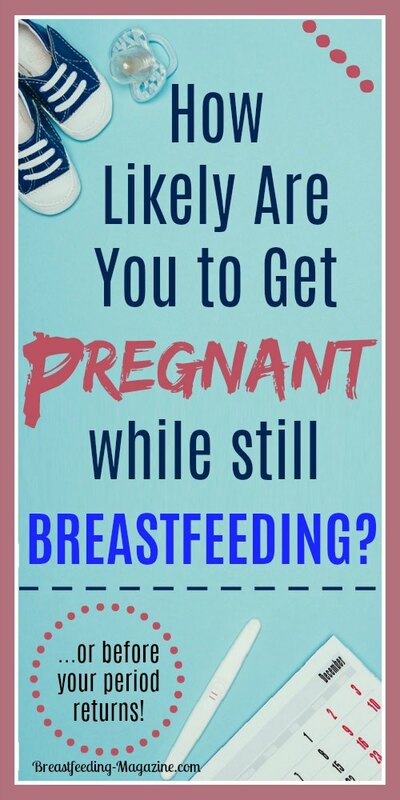 So Can I Get Pregnant When Breastfeeding? Now, what if you want to get pregnant as soon as possible? You should give your body some time to recover from your previous pregnancy, and spending at least one year nourishing your baby with wholesome breast milk will give you that time. The best way to increase your chances of becoming pregnant again is to start adding other foods your baby’s diet or stretching out how long your little one goes between feedings. NOTE: Keep in mind that there are many health benefits for both you AND your baby to breastfeed exclusively for at least six months after birth so don’t rush it! When baby starts taking more calories from other food than from breast milk, most women see their menstrual cycle re-established quickly. Changes that are more abrupt (like dropping a nursing session with a toddler) tend to bring fertility back faster as well. Once you have re-established routine periods, your breastfeeding experience should no longer impact your ability to conceive a baby. If you easily conceived prior to your pregnancy, then chances are high that you will have the same experience when you’re ready to conceive again. 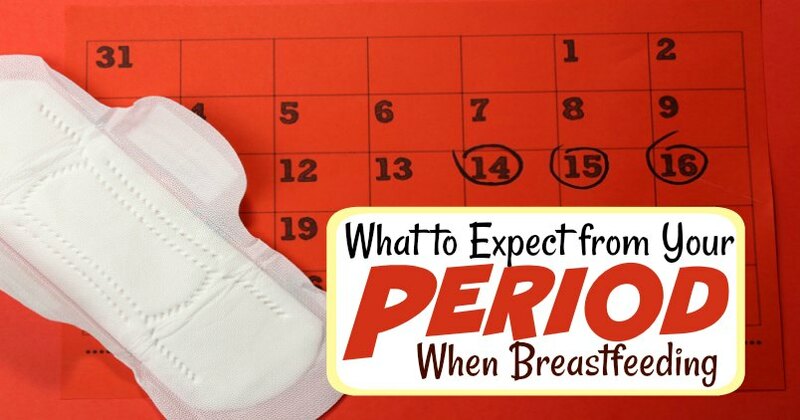 How Do Periods Affect Breastfeeding? Some women worry that their period will in some way change the quality or safety of their breast milk, but this is entirely untrue. There is no need to stop breastfeeding once your period returns, even if you are bleeding heavily and having routine periods just like your pre-pregnancy cycle. You will continue to produce nutritious milk that will help your baby thrive, but there are some changes that you may change your baby’s reaction to your milk. Does Breast Milk Taste Different During a Period? The biggest complication for most babies is the change in the taste of the breast milk. It’s possible for your period to create a slight change in how it tastes, and this can start a few days prior to your period starting. Some babies react strongly to the change and will start to feed less aggressively or for shorter durations. Other babies continue to feed like little champs and seem to not notice a change in the taste at all. What can you do if you believe that your baby is feeding less during your period because of that change in taste? If you also pump and have a freezer stash, you can always supplement with milk collected between periods, allowing your baby to fill his or her belly to satisfaction without being forced to take in milk that they don’t like. 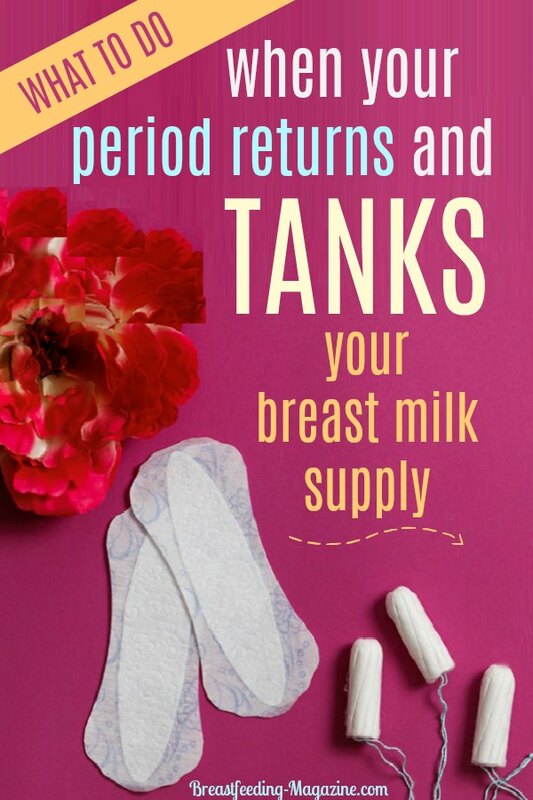 If you haven’t been pumping or don’t have much of a stash left when your periods return, then you could try to start pumping a bit extra between periods to use this approach. If your baby is eating less during your periods and you don’t want that to cause a decrease in your milk production, consider pumping during your periods. Even if your baby doesn’t like the taste of that milk, you will continue sending the message to your body that your baby is still demanding more milk for nourishment. Related Article: Breast Milk Color – What Is Normal? Why Does It Change? Does Milk Production Slow During a Period? Some women do notice that they naturally produce less milk during their periods, but others continue to breastfeed with no noticeable change in milk availability. This is a common experience, and the supply usually picks back up once the period ends. If you milk production does slow down, this has an immediate impact on the baby because he or she doesn’t feel less hungry just become mommy is having a period! This is where a freezer stash could again come in handy, giving you more milk to offer your baby when your body doesn’t want to meet the demand. You may just want to breastfeed more often to signal to your body that your bay needs more milk right now! Many women without freezer stashes will simply feed their babies more frequently to make up for there being less milk available at scheduled feeding times. Your baby may also demand extra feedings if he or she isn’t getting enough milk at those normal feeding times. It is nothing to worry about. Our bodies were made to adjust to what baby needs! Will My Period Affect My Milk or My Baby’s Behavior? All of these changes can impact how well your baby sleeps and may make some babies cry and fuss more than usual. If your little one isn’t getting the amount of milk that they need to feel satisfied, they will naturally wake up more often demanding nourishment. They may also just seem unhappier in general, which is what hunger can do to all of us naturally. This can happen anytime that your baby’s normal feeding routine is interrupted or changes in some way, so it’s not limited to the return of your period. Your baby’s lack of sleep and tendency to fuss can have an impact on your health, and it can impact the flow of daily life for your household. This isn’t a problem for some mothers, so count yourself among the lucky if your baby doesn’t react badly to the taste of your period at this time and your breasts are able to keep up the production regardless of your period. If your breastfeeding habits are seriously impacted by your periods, consider talking to your doctor about alternative feeding methods that may help. This may be the time to dip into that freezer stash, or perhaps your baby is about ready to start receiving some solid foods anyway. These are personal decisions that only you can make along with your doctor, but it is important to make sure that your baby is well fed even if you experience some complications once your periods return. Breast Milk Color – What Is Normal? Why Does It Change?